So I’ve been wanting to read this book for awhile and I finally got it at the library and read it in a few days time. At every step, Tebow’s life has defied convention and expectation. While aspects of his life have been well-documented, the stories have always been filtered through the opinions and words of others. 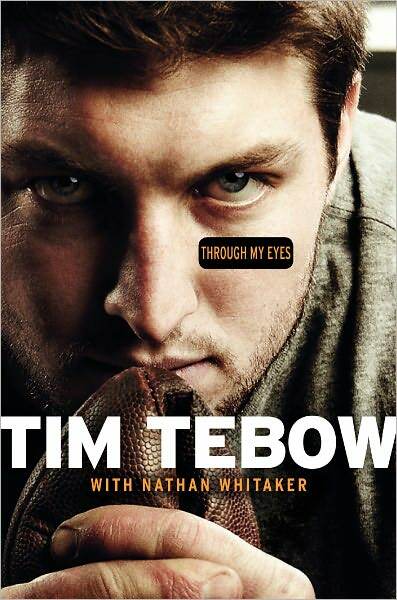 Through My Eyes is his passionate, firsthand, never-before-told account of how it all really happened. Here are a few excerpts I Loved! page 16: “…So if everybody was doing the same thing, the normal and usual thing, I looked for a different way. The crowd, by definition, gravitates toward average, which could tend toward middle of the road or toward mediocrity. If we’re all special in the same way, then nobody really is. A view of that kind of life, I believe discounts the belief that God created each of us special, each with gifts and abilities like no one else’s. He create each of us different, fully intending that we would use our unique gifts and abilities to do what He created us to do. You and I were created by God to be so much more than normal. My parents always told us that was true of each of my siblings and me. page 69: “At the same time, there was a lot of attention on me and whether I would perform at the level everyone expected. In the lead-up to the season, I’d learned that Ken Murrah of Ponte Vedra Beach wanted to film a documentary about me, which was scheduled for broadcast on ESPN. It certainly fit within the framework of the admonition of Proverbs 27:2 to “Let another praise you, and not your own mouth; a stranger, and not your own lips.” It was flattering that they would want to do that, and even thought it was very well done, I couldn’t help but be pretty embarrassed by its filming. And the title was the worst part of the embarrassment. page 136 & 137: “…a day after the Auburn loss, Lousiana State students took it upon themselves to do their best to make me feel welcome as we prepared for our visit the following weekend. So all that to say, I’m buying this book! Also, there’s been quite a bit of news about him lately…check out this article for just a sample.